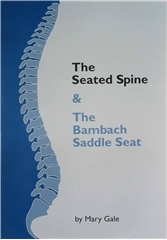 Mary Gale, the occupational therapist who designed the Bambach Saddle Seat, explains in clear and simple language, aided by many illustrations, the health benefits of saddle sitting. Informative chapters on problems with school furniture, the problem with flat seats, back problems in general, and work-surface heights. Geared toward applications of the Bambach Saddle Seat for able-bodied adults and children.